All eyes are on Bank of England’s crucial interest rate decision within a few hours. The US dollar lost some strength when the Federal Reserve released the Beige Book. 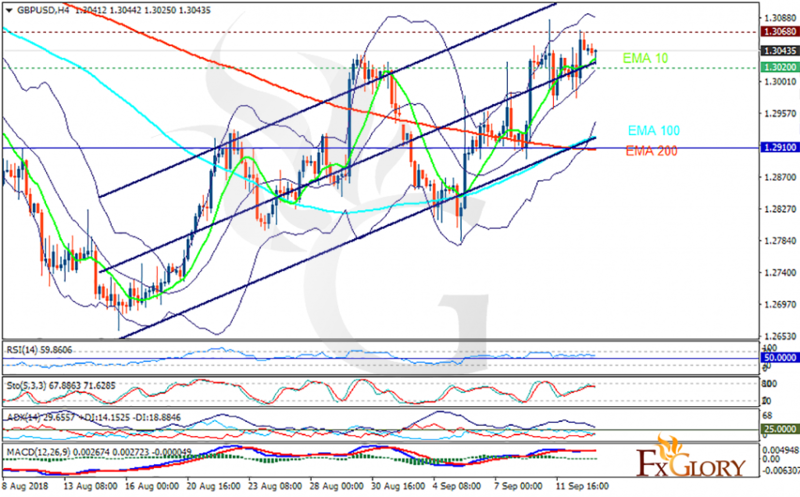 The support rests at 1.30200 with resistance at 1.30680 which both lines are above the weekly pivot point at 1.29100. The EMA of 10 is moving with bullish bias in the ascendant channel and it is above the EMA of 200 and the EMA of 100. The RSI is moving above the 50 level, the Stochastic is moving in high ranges and the MACD line is on the signal line in the neutral territory. The ADX is not showing any strong signals. The Brexit mostly determine the price direction however, the support level breakthrough will push the price down to the lower Bollinger band at 1.29. Otherwise, GBPUSD will continue its bullish trend towards 1.315.